Computing as you know it has changed. No longer are you tied to using expensive programs stored on your computer. No longer will you be able to only access your data from one computer. No longer will you be tied to doing work only from your work computer or playing only from your personal computer. Enter cloud computing-an exciting new way to work with programs and data, collaborate with friends and family, share ideas with coworkers and friends, and most of all, be more productive! The "cloud" consists of thousands of computers and servers, all linked and accessible to you via the Internet. With cloud computing, everything you do is now web-based instead of being desktop-based; you can access all your programs and documents from any computer that's connected to the Internet. Whether you want to share photographs with your family, coordinate volunteers for a community organization, or manage a multi-faceted project in a large organization, cloud computing can help you do it more easily than ever before. Trust us. If you need to collaborate, cloud computing is the way to do it. 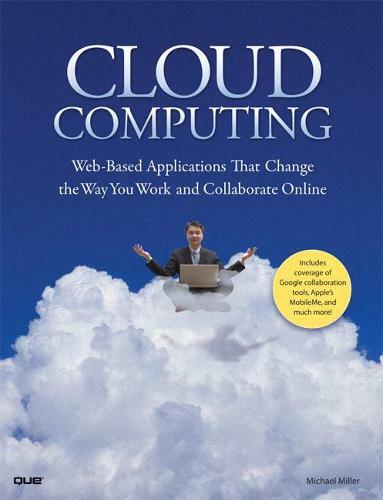 * Learn what cloud computing is, how it works, who should use it, and why it's the wave of the future. * Explore the practical benefits of cloud computing, from saving money on expensive programs to accessing your documents ANYWHERE. * See just how easy it is to manage work and personal schedules, share documents with coworkers and friends, edit digital photos, and much more! * Learn how to use web-based applications to collaborate on reports and presentations, share online calendars and to-do lists, manage large projects, and edit and store digital photographs. Michael Miller is known for his casual, easy-to-read writing style and his ability to explain a wide variety of complex topics to an everyday audience. Mr. Miller has written more than 80 nonfiction books over the past two decades, with more than a million copies in print. His books for Que include Absolute Beginner's Guide to Computer Basics, Googlepedia: The Ultimate Google Resource, and Is It Safe? : Protecting Your Computer, Your Business, and Yourself Online. His website is located at www.molehillgroup.com.